Tina Romenesko PYT/RYT is a Professional Yoga Therapist and certified Mindfulness Based Stress Reduction (MBSR) Teacher, and has been studying and practicing yoga for over 38 years. Her focus is on the therapeutic potential of yoga to heal body, mind, and spirit. 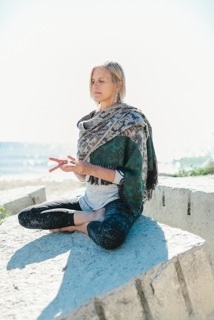 She has completed over 1000 hours of certification including advanced training from Integrative Yoga Therapy in Mudras, Pranayama, and Bandhas. REFERENCE MATERIAL includes MUDRAS for Healing and Transformation by Joseph and Lillian LePage and MUDRAS of India by Cain and Revital Carroll.